The East Jemez Landscape Futures (EJLF) is a collaborative process that aims to develop a holistic and forward-looking approach to managing areas of the eastern Jemez Mountains that have been altered by drought, high severity fire, and post-fire flooding. In order to engage a diversity of regional stakeholders and understand perspectives about the impacted landscape, we conducted a needs assessment to launch the project. 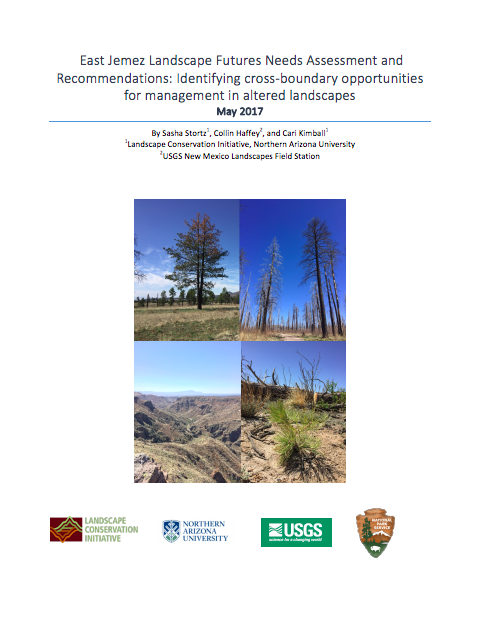 Through interviews with 50 individuals representing over 20 agencies and organizations in the eastern Jemez area, we identified common interests and concerns, opportunities for action, and developed recommendations for next steps in the EJLF project. Interviews centered around three topics: work that is currently happening in the area, information needs, and opportunities for collaboration. Convene watershed work groups to focus research and action on specific canyons in the eastern Jemez.Seek funding at the canyon and landscape-scale to provide the increased capacity needed to conduct work in these areas. Overall, interviewees expressed support and willingness to participate in future collaboration in order to learn from each other, build a shared sense of possibility, and take action in the highly impacted areas of the eastern Jemez. In order to develop and maintain support across stakeholders, future steps should be transparent, interdisciplinary, and inclusive.